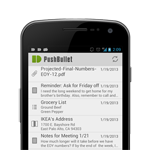 The meat of this functionality lives in PushBullet's online dashboard, but the app received some attention as well. Besides bug fixes, the app now supports Gingerbread and Honeycomb devices, and will give you a preview (in the notification tray) of any image being pushed to your device. For more information on the update, check out the official PushBullet blog, linked below, and hit the widget to grab the update. Update: After some quick testing, we've hit just a couple of bugs – it seems that the app's Chrome extension doesn't recognize shares just yet, and long list items can't be properly viewed before completion. Finally, when a friend pushes to your device, the notification appears to have come from your own account. Of course, we've reported all of these to the developer, and will hopefully be seeing another update soon. Update 2: We've heard back from the developer with assurance that the above issues are being looked into and will hopefully be fixed in an upcoming weekly update. Update 3: It looks like the notification name bug mentioned above has already been fixed, and we've heard from the dev that a Firefox extension will be coming "very soon."